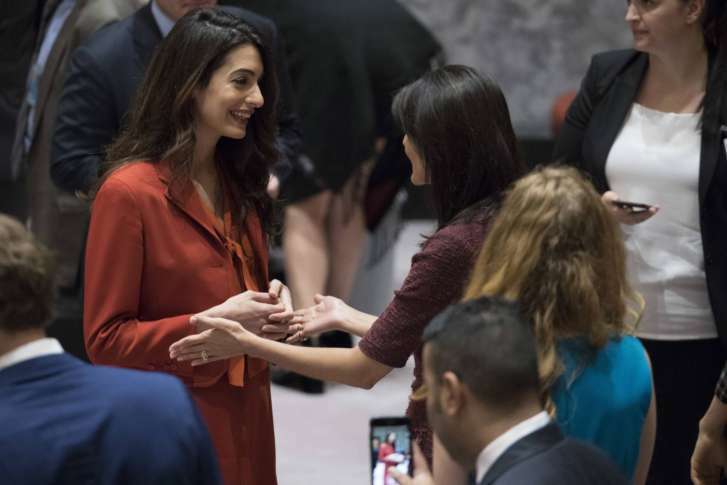 Iraq, council members and human rights lawyer Amal Clooney portrayed the measure as a key step toward bringing the Islamic State group to justice for atrocities committed since its bloody rise a few years ago. But the advocacy group Human Rights Watch faulted the Security Council for not extending the investigation to abuses by Iraqi and other forces fighting the IS militants. The council voted unanimously to ask the U.N. to establish an investigative team to help Iraq preserve evidence “that may amount to war crimes, crimes against humanity and genocide” committed by IS, variously known as ISIS, ISIL and Daesh. “This resolution … is a victory for justice, a victory for humanity and a victory for the victims,” said Iraqi Foreign Minister Ibrahim al-Jaafari. IS militants seized parts of Iraq in 2014 and proclaimed it a caliphate under Islamic rule. It soon became a realm of horrors, including mass killings, beheadings and rapes. U.S.-backed Iraqi forces retook the country’s second-largest city of Mosul from the extremists in July. The forces have now driven IS from most of the land it had seized in Iraq, retaking all the major urban areas, although the group still controls some pockets in Iraq as well as territory in Syria. Iraq and Britain have spearheaded the investigative measure. “This resolution means that the international community is united in our belief that there should at least be accountability for those who perpetrated such wanton acts,” said Alastair Burt, the British minister of state for the Middle East, as he announced that the U.K. would provide 1 million pounds ($1.35 million) to the investigative effort. She was on hand for the council’s vote Thursday but had no immediate comment afterward. U.N. investigators will be able to help identify victims and perpetrators and “provide an indispensable record of the scope and scale” of IS atrocities, U.S. Ambassador Nikki Haley said. Burt said the measure gives priority to Iraqi courts to try the cases but left a door open for other courts to get involved. Human Rights Watch called it a missed opportunity. “No one denies the importance of tackling the widespread atrocities by ISIS in Iraq, but ignoring abuses by Iraqi and international forces is not only flawed, it’s shortsighted,” said Balkees Jarrah, the rights group’s senior international justice lawyer. Iraqi Prime Minister Haider al-Abadi has admitted that anti-IS forces have committed abuses, but he insists they were not “systematic” and that those responsible are being held accountable. Human Rights Watch, however, says many such abuses aren’t being investigated by authorities in Iraq, as far as the group can tell. The Iraqi and British U.N. missions didn’t immediately respond to inquiries about the rights group’s criticism. Associated Press writers Alexandra Olson at the United Nations and Susannah George in Baghdad contributed.